Hot on the heels of Initiative CEO Melissa Fein starring in a Carlsberg ad we yet again have another adlander featuring in a campaign. 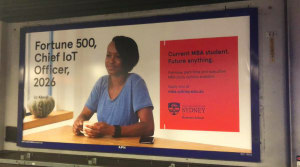 Head of platforms at Oath, Liz Adeniji, stars in The University of Sydney 'Future Anything' campaign which asks its master of business administration (MBA) students to envisage a future they wanted. Adeniji, who was previously head of platforms at BrightRoll, head of sales at Yahoo7 and has also worked at companies such as Fairfax Media and Rocket Fuel, studies part-time while working in the industry. “I'm currently studying an MBA at its business school and I was asked to participate in the campaign,” Adeniji says. The campaign, created by The Monkeys, asked five MBA students from different walks of life to share their ambitions and can be seen across print, digital and out of home. In August AdNews reported how Initiative CEO Melissa Fein was the face of the Carlsberg campaign series 'Probably the Best'. The short film series, made in collaboration with Dundas Media, features Australian business leaders who "are probably the best" in their respective fields. The video shows Fein during a regular business day in the Initiative office, leading team meetings but also taking time out of the day to "raise a glass" of Carlsberg with co-workers. AdNews investigation: Is university education still relevant to the industry?